Victoria Marble Fireplace is frequently restocked due to it’s popularity. 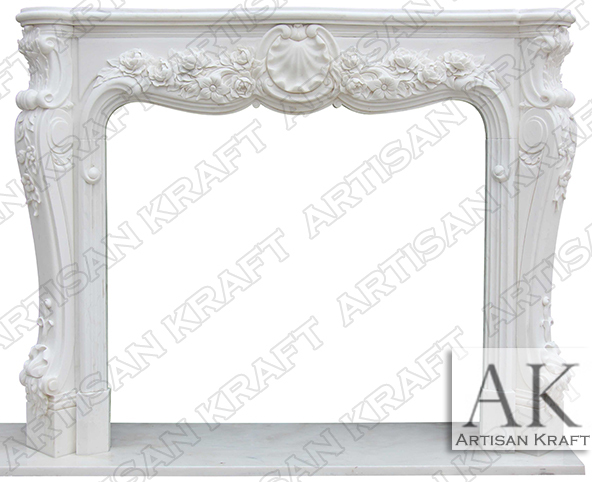 Carved here from white marble this French style fireplace mantel has all the attention drawing details one may want. The C scrolls combined with S scrolls shape the surround legs while adorned with finely carved leaves and flowers. The leafing and floral details can be minimized or removed if you choose to customize this mantel. Several other similar French fireplace mantel designs come with less detailing. It is recommend to carve this surround from a polished marble. To achieve a more rustic or antique look consider using travertine. This can be priced out for you.